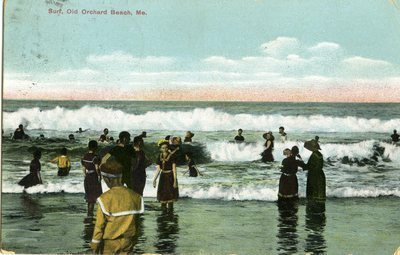 "Old Orchard Beach, Maine, Surf Postcard "
An image scanned from a postcard of the surf at Old Orchard Beach, Maine, and people swimming who are wearing very old fashioned swimsuits. Women are wearing long dresses and the men have on long pants. The postcard is not dated.